What is roaming and how do I roam with ookyo? Can I make calls while roaming? Can I use mobile data while roaming? 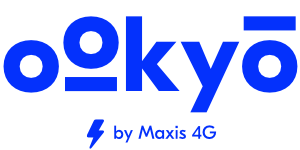 Yes, just make sure you've minimum RM10 credit in your ookyo wallet. For roaming rates, you can refer to the latest rates here. Remember to select 'Hotlink'. What are your voice and SMS charges? 5 reasons why you should join ookyo! Is Unlimited Internet really unlimited? What apps can I pick?